Announcement NEW: Many paintings may be personalized on the back. Please contact me for possibilities for your idea or event. This is perfect for host(ess) or wedding party gifts. Note: customized items may not be returned. 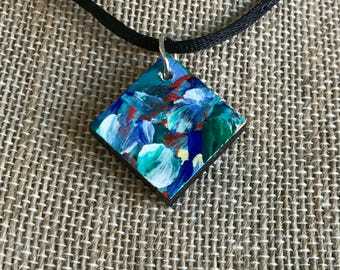 💜 I believe everyone should be able to own their own special piece of art, whether it is a 3/4 inch square tile or a 6 foot canvas painting. 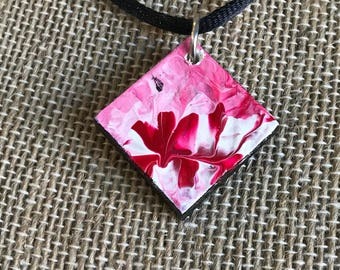 ❤️ So I came up with the idea of creating Unique Art Gifts to make art accessible to everyone!! 💚 Original artwork is Acrylic unless otherwise stated. 💙 My goal is to have 100% happy customers. If you have questions please don’t hesitate to contact me. NEW: Many paintings may be personalized on the back. Please contact me for possibilities for your idea or event. 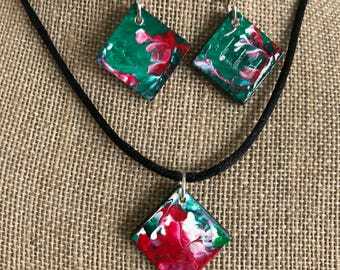 Wearable Miniature Acrylic Paintings: Necklace and Earring Set. Purple, Green, Blue. Earring has a “5” on it. Very lovely sculpture! Quick shipment and great packing. Very pleased. 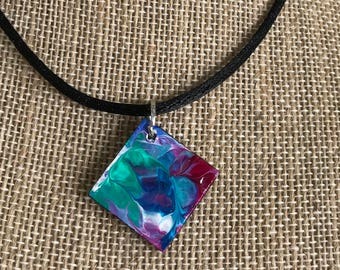 The necklace I purchased is wonderful! It has gotten rave reviews from my friends. 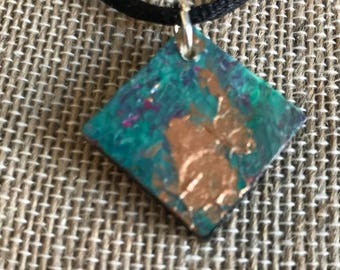 I will continue to watch this site for more unique wearable art! 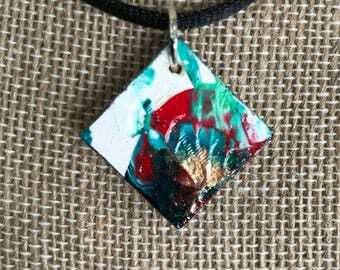 Unique Wearable Original Mini Painting - Striped Abstract Of Earth Colors. Has a sideways “A” visible. 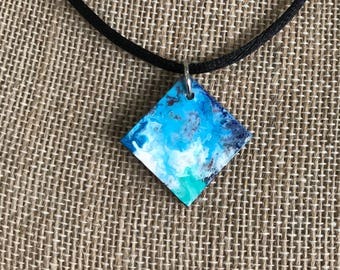 I have so much fun making these miniature necklaces. It’s like having my own private jewelry store. 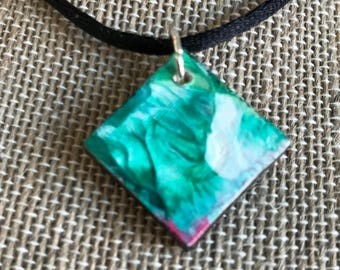 I use the same professional acrylic paints on all my products from Gallery sized paintings to miniature jewelry tiles. I often work on numerous pieces at that same time. A painting is so much more than color on canvas. Every painting is an artifact from a sacred, evolutionary pilgrimage towards unconditional love. The evolution of Cyd Rust’s artwork has been intricately woven with her journey of healing; as the artist evolves, so does the practice. When faced with the unexpected that life brings Rust heads to the studio, channeling joyful abandonment with vibrant, inspirational color. Hailing from a family of artists, Rust grew up immersed in creativity; her first language is the visual language. She worked at one of the largest sculptures in the world, Mount Rushmore, while in college. Later as a costume designer for Arabian Horse shows and competitive figure skaters, Rust immersed herself in the color, textures, and pattern of fabric, which continue to inform her work. Rust’s expansive heart shines through in her love of animals, and creatures of all kinds make regular appearances in her artwork. At 35 years Lupus manifested in her body. That same year her husband was transferred and they moved from Omaha, Nebraska to Loveland, Colorado. She saw only opportunity in her new situation and as much as she could, she filled her schedule with classes at the Loveland Academy of Fine Arts. Sculpture became her passion and as Loveland was considered the “sculpture mecca” of the US at the time, she had many opportunities to develop her craft, and gain professional recognition for her efforts. 8 years later, Rust was diagnosed with cancer. She found that the earthy browns of the clay and wax weren’t inspiring her like they used to. 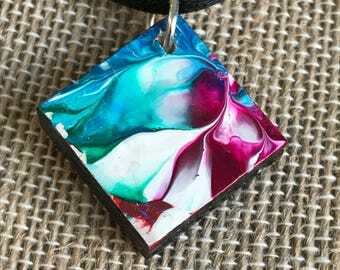 Her soul cried out for color, and she answered that cry by filling her life with vibrant color through painting – which quickly became her new love. She dove into the study of realism, color, and light with greats like Steven Quiller and Arleta Pech. She survived the cancer, and the joyful colors continued to illuminate her work. In 2014, her work evolved again when she was diagnosed with inflammatory arthritis in her dominant hand. She found herself unable to paint with the detail required for realism. This is probably where most artists would have thrown in the towel. However, Rust adapted; making the choice to evolve her artwork yet again, knowing and trusting the “therapeutic value of staying in your lifeforce.” She studied with Flora Bowley and learned an intuitive approach to painting. 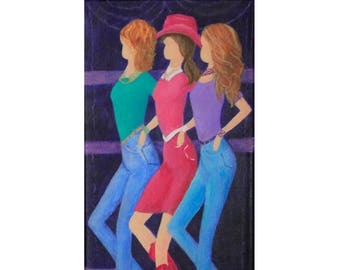 Her process incorporates dance and movement. Instead of tiny brushes, she began using larger foam brushes from the hardware store and different household tools for mark making: rulers, old pill bottles, finger-painting, anything she could find. As the passion for her process and healing grew, she began projecting these feelings into the work by writing inspirational words in the foundational layers. Her work took on a new vibrancy, freedom, and life. Prednisone, a common medication for Lupus, has a side effect of weakening the bones. The effects compounded about a year ago when Rust broke her back. While she’s temporarily unable to stand and dance while she paints; her positivity radiates with the knowledge that this too is temporary. “Everything is for now.” For the time being, she is working on a smaller scale, at her desk. 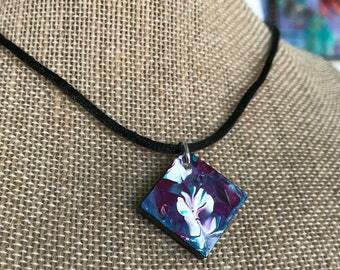 The smaller scale gives her the opportunity to infuse each piece with the energy of sacred evolution and healing. We always have a choice. During difficult times, our choices can be clouded in heartache and we forget to choose our joy. While “choosing joy” sounds like a catch phrase you’d see on a decorative wall hanging – the reality of the idea is anything but trite. With each hardship Rust has consciously channeled her light and creativity into her artwork to adapt and evolve. 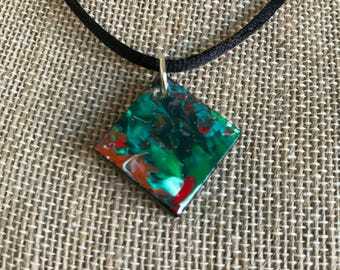 When Rust takes the courageous steps into her studio despite pain, she is choosing joy. She’s holding her light high so that we can follow suit. She’s made vast adaptations to her process along the way, loosening up, becoming more experimental, playful, and joyful in her methods. How we show up in the world must also adapt in order for us to evolve. Rust’s artistic practice is an exemplary example of how to choose illuminated joy every day. Rust’s artwork is more than just color on canvas; these paintings are a story of inspired evolution.